The origins of FRIO date back to the early 1990s when husband and wife team, the late Garnet and Althea Wolsey, developed a range of cooling head, neck and wristbands for their youngest daughter Helen Wolsey. Helen was British Powerlifting Champion 1986 to 1992 (at 44kg body weight), representing Great Britain at European and international level and achieved World Champion status in 1991-92 and 1992-93. During the 1991 World Powerlifting Championship held in New Delhi, the temperature in the ‘warm up’ room was measured at 110°F. Helen, who today is Design Head of FRIO, discussed the challenges of competing in this heat with her parents and this started the initial idea for FRIO cooling bands. In 1996 these revolutionary cooling bands were used by the British Olympic and Paralympic teams in Atlanta. After a discussion with a family friend regarding the need to keep their insulin cool, Garnet and Althea realised that their cooling technology was transferable and could perfectly meet the needs of people with diabetes. The development of the world’s first patented cooling wallet followed, with production commencing on the family farm in Pembrokeshire. The FRIO wallet soon became a worldwide phenomenon and with growing demand, FRIO built a production, storage and distribution headquarters at the original location. In 2011 Chris Wolsey, the youngest son of Garnet and Althea, took over the reins of the company as Managing Director. 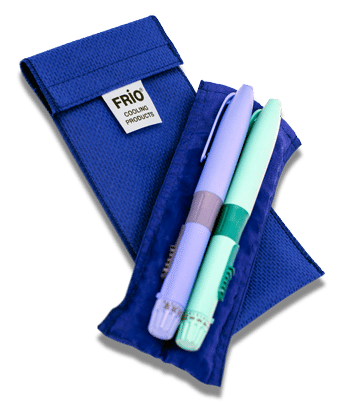 FRIO now exports to over 70 countries around the world, producing a range of cooling products using its patented technology, including wallets for insulin and other temperature-sensitive medicines, drinks coolers, cosmetic wraps and head, neck and wristbands. We make the widest range of medicine cooling products in the world – there is a FRÍO® for you! Find out how using a FRÍO® can give you freedom to get out and about every day. Making a FRÍO® part of your life is simplicity itself. Find out how using our easy guide.